Our annual Keep Space for Peace Week was a resounding success this year. We had more than 90 events in 13 countries – the highest total in recent years. We are grateful to all who organized video showings, protest events, and street leafleting to help educate the public. Here in Maine we held two vigils at Bath Iron Works where the Navy’s Aegis destroyer is built. The Aegis is outfitted with “missile defense” systems and is now being deployed just off the coast of China as part of a doubling of U.S. military presence in the Asian-Pacific region. China imports the majority of its oil through the Taiwan Straits and the U.S. strategy is to put in place the ability to choke off this importation thus giving the U.S. the ability to control the keys to China’s and the world’s economic engine. This is creating a dangerous arms race in the region. It was one of these Aegis destroyers that fired an interceptor missile in February 2008 that knocked out a wayward U.S. spy satellite that was falling back to Earth. At the time the public was told the satellite’s on-board hydrazine fuel would be a danger to the planet, but we have since learned that the fuel was largely gone at the time of the intercept. In the end the real reason for the shoot-down was to test the ability of the Aegis system to also function as an anti-satellite (ASAT) weapon. In my own speech at the BIW rally I talked about a small South Korean island called Jeju that sits just off the coast of China. Jeju has been designated as an ecological preservation site by UNESCO for its rare and beautiful species of coral (such as Alcyonium gracillimum) and shells (such as Charonia sauliae) which are in the brink of extinction). Little did we know that as we were protesting against the “Christening” of the Aegis in Bath, Maine that activists from Jeju, on October 18, were holding an action to oppose the construction of the Navy base on Jeju Island. 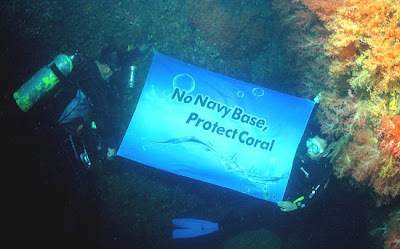 Six people from a local village on the island went underwater on October 18 and held banners amongst the colorful coral protesting the base and expressing their concern that the coral life would be destroyed by the Aegis. 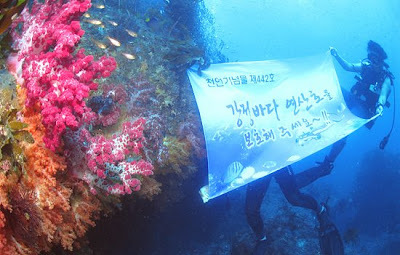 Thanks to Global Network member Sung-Hee Choi, who lives in South Korea, we were able to learn about this protest under the waters of Jeju Island. This is just one example of how our international solidarity around weapons in space issues is growing. Next April 2-4 the Global Network will hold its annual space organizing conference in South Korea as we try to learn first-hand more about the dangers of U.S. “missile defense” deployments to surround and “contain” China. The Jeju Island story completes the circle. It reveals how the weapons in space issue impacts even life under the seas. The people of Jeju Island are asking all of us to connect these dots and to help stop this deadly arms race from destroying their culture. Peter Woodruff, working at BIW and courageously speaking out for conversion, shows us the way out. We don’t have to build weapons for endless war to provide jobs in our communities. We don’t have to waste our tax dollars on an arms race to control the world’s diminishing resources. We can build rail, solar, and wind power systems and protect our Mother Earth.